Paul McLean presents Coleraine boss Oran Kearney with the BetMcLean Manager of the Month award for September. Coleraine boss Oran Kearney has made it back to back Manager of the Month awards. Kearney was named BetMcLean Manager of the Month for September by the NIFWA after the Bannsiders enjoyed another stunning month. Coleraine finished September unbeaten with wins over Glenavon, Ards, Carrick Rangers and Ballymena United to their name. 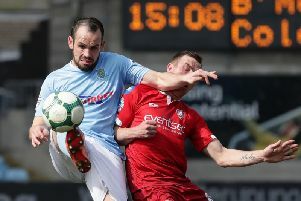 Kearney said, "It's a great honour for me to win this award twice in two months and I would like to thank the Football Writers' and Bet McLean for their support. "It's been an incredible few weeks for the club and we are really enjoying it, but at the same time our feet our firmly planted on the ground. "We're well aware that it's the start of October and there is an awful lot of football to be played, but at this moment in time I am delighted with our performances. I couldn't be happier for the boys. "This success is a product of their hard work, so this award is as much for the players as it is for me."